WEAKER DEMAND: It’s not that consumers are less interested in the art form; rather, the much higher efficiency of new distribution models (electronic sell-through (EST), subscription-video-on-demand (SVOD) and rental-video-on-demand (VOD) make content access so ubiquitous and convenient that consumers satisfy more of their potential “use cases” for the product without having to buy, subscribe to, or rent the same IP multiple times. INCREASED SUPPLY: Separately, technology has “democratized” both production and distribution, resulting in a massive supply of new content of all kinds, vying for audience. Last year, the supply of new video to YouTube alone reached 100 hours per minute and more than four billion daily stream starts. It may not all have the production value of a Hollywood blockbuster, but data like that indicate that people are spending substantial time with content from outside the establishment. When one considers console gaming, mobile apps and other drivers of fragmentation, it’s easy to see that movies and prime-time television now have significant competition for raw attention, and perhaps pop-cultural significance. A third factor, that is largely a product of the first two, is a growing detachment between film content franchises and audience. The “distraction” by so many competing forms of entertainment and the “efficiency” of cheap, always-on smorgasbords have made it much more difficult for any individual content franchise to first establish, and then maintain a significant, lasting relationship with consumers. As always, there are notable counter-examples (I am betting that my own children will be vested in Disney’s Frozen for quite a while). But whereas once the “big screen” was, by default, the backbone of the cultural landscape, today any given film is at risk of falling in behind a serialized original like House of Cards, a prolific online game such as World of Warcraft, or even a YouTube star as with Dane Boe (of “Annoying Orange” fame). This all may be a bit unsettling to an industry with such a rich history of synthesizing iconic properties through its vaunted production and marketing operations. For the past 35 years, Hollywood has not only leveraged many new distribution mechanisms for the films themselves, but also developed sophisticated licensing operations to address a range of ancillary markets (e.g., books, games, toys, apparel). As the IP holder, a studio will typically “quarterback” these activities, but in a relatively passive way: specialist licensees pay up-front fees and/or a revenue share for the privilege of monetizing the IP, and the studio retains some veto over marketing and positioning as it cashes the checks. In the “pre-digital” era, this approach made practical sense. The creation — and more importantly, the distribution — of these various products and services required capabilities (and risk tolerance) far beyond those of a film studio, and there would have been no elegant platform to tie a movie transaction directly to the sale of a video game, to the release of a comic book, to a t-shirt offer, etc. But today, consumers are laser focused on devices and services that blend all of these elements, and much more. Hollywood’s challenge is therefore twofold: strengthen the relationship between its IP and audiences amid the swell of competitive content; and maximize fan interaction and investment across all exploitations of its copyrights. The elegant solution to both is the franchise hub. 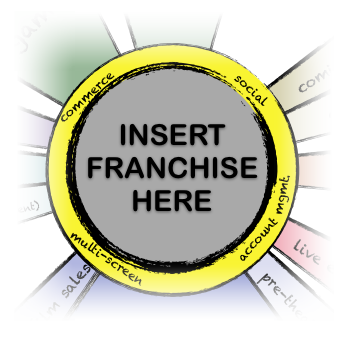 A franchise hub functions as the ultimate nexus of all exploitations around a particular content property. The diagram illustrates this in both a figurative and practical way. Figuratively, it affirms that content owners should actively manage the various exploitations of their content, collecting and analyzing data across the ecosystem to inform the mix of revenue models, release timing, etc. 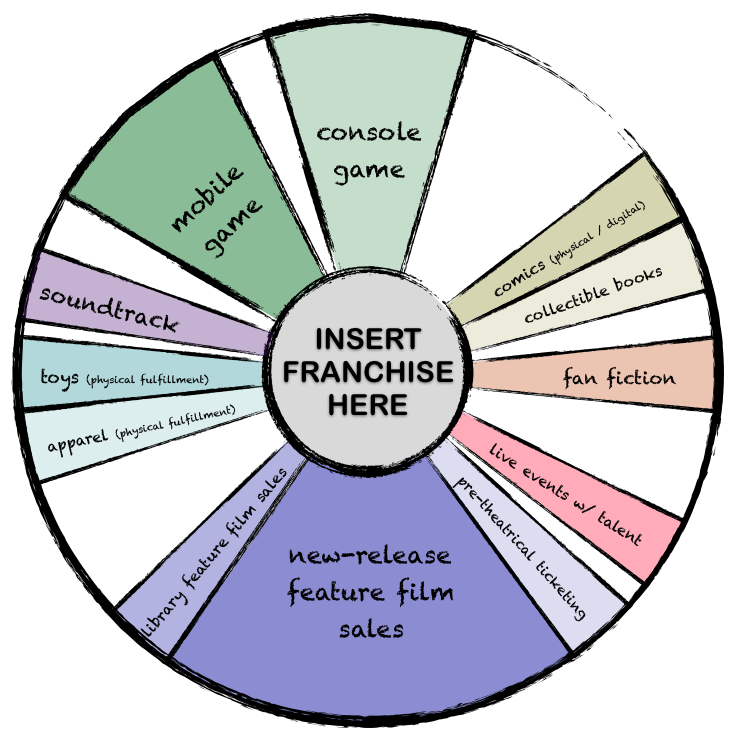 At the same time, the wheel also represents the schematic for a high-level mapping of the consumer experience, into which all of the franchise’s various products and services connect. This allows for near-seamless navigation, organic cross-promotion and the ability to bring the behaviors or achievements in one area to bear on another. Of course, the particular mix of exploitations shown here is for illustration only. In reality, the composition would be relatively unique to each franchise, and the white space between “spokes” suggests that expansion over time is desirable. BUSINESS MODEL: Does the consumer have to own the movie? Do they get all this extra content for free? Who is selling it? Who is maintaining it? How will downstream partners react? Would there be advertising against it? MARKETING: How will this be promoted? Is this an extension of the home video business? Does it piggyback on the theatrical marketing effort? On home video? ACCESS: How is it accessed? On the web? Devices? Does the consumer download an app? Where is all the content stored? Again, who is standing behind all of this on a 24/7 basis? In my view, some of these questions have fairly dogmatic answers, while others are more subjective. Much of the way that franchise hubs are deployed will depend on the state of technology over time, market leverage of various players, and of course, individual studio sensibilities. At this early stage, it’s most productive to focus on some general design principles that should be applied, regardless of the particulars in execution. Avoid brand “hibernation” — storytelling is an always-on activity. To more effectively manage franchises, Hollywood needs a way to drive a more consistent brand dialog with consumers. The typical “windows” of first-run exploitation last 2-3 years, but the most potent marketing efforts drop off after the home video release, just a handful of months following the theatrical premiere. The capital-intensive nature of production and distribution, makes it impossible (or at least, impractical) to release new film installments less than 12-24 months apart, so the audience can go long stretches without any meaningful marketing, or progress in the mythology of a franchise. Further, as mentioned before, the oversupply of content of all types and forms makes it more difficult for even well-promoted IP to remain top-of-mind between “tentpole” events. Producers should look to other formats (e.g., episodic, short-form) and storytelling devices to perpetuate the franchise and keep audience attention on a more consistent basis. It’s worth noting that episodic formats have long been powerful bases on which to grow content franchises, and this is due in large part to the more regular cadence in which the stories are told. Frame offerings as dynamic services, rather than static products. Traditional home video, game, and other content products are relatively fixed: that is, once composed, rendered and released, each of these experiences tends to remain constant. Even as formats evolved in the digital age, the “fixed bits” approach persisted, so that any “updates” to the content were delivered in a separate, subsequent release of the product (think “Special Edition” or “Version 2.0"). This re-release tactic may have juiced P&Ls in the past, but as noted before, consumers are no longer lining up to make multiple investments in what is essentially the same core product. With a central, digital destination established, creators can deliver a wide range of dynamic experiences that go beyond behind-the-scenes clips or a deleted scene. For example, studios could periodically stream “town halls” with talent to owners of the film, enable live “viewing parties” among small groups of ardent fans, and allow consumers to connect and collaborate on their own spinoff stories. Of course, this is all in addition to the many other content forms (e.g., games, books, image galleries, music) that are tied together by the hub. These updates both freshen the product experience and help to smooth the “valleys” of awareness that occur between major releases. As mentioned, technology and marketing have given rise to a multitude of new distribution mechanisms for feature films, and also created a broad portfolio of ancillary products based on the IP. These revenue streams evolved through external partnerships with firms willing and able to translate the studio copyrights into new products or services. Few that I can think of (home video is the key exception) ever motivated the major studios to augment their own structures to bring these operations in house. Rather, the licensing playbook emphasized up-front cash and upside participation to the studios, while downstream partners engaged at the retail level. For a long time, this “lean back” approach was a boon to Hollywood because it unlocked incremental profits without imposing any substantial risk. But in this era of data-driven marketing, those that can quantify the audience are most likely to prosper. By weaving together all of the aspects of consumer interaction around a particular content property, franchise hubs are an excellent vehicle through which important behavioral data can be collected. Certainly, it’s possible that a more “lean forward” posture by studios could raise resistance from downstream partners. But owners of the IP must take ultimate responsibility for nurturing its growth and managing its exploitation, and cannot afford to “fly blind” when it comes to consumers. Perhaps the tenets of these long-standing partnerships should be re-examined. Blend pricing models to better segment the user base. It’s common sense that effective consumer segmentation is critical to maximizing revenue. But the home entertainment business is based on two notional price points: rental ($1-$5 retail) and sell-through ($15-$20 retail). There’s no mystery as to which yields higher marginal profit, and though protecting the sell-through business is critical, relying on it solely is dangerous; because in this era of content overload, too many consumers may find cheaper ways to pass the time. Transaction lost, and further detachment of the audience from the franchise. One solution may be the micro-transaction model, though not necessarily implemented in the same manner that has made it controversial in gaming circles. Fundamentally, it’s easier to ask a consumer to part with $1-$2 on an impulse than it is to ask for 10x as much. So perhaps there are ways to entice a handful of small “investments” in content franchises from more casual consumers that would otherwise have yielded nothing. To be clear, I am not suggesting to make the feature film accessible for a single buck. But once the various exploitations are wired together, one could imagine a user unlocking portions of video content by achieving certain objectives in a mobile game, for example. Enable “core” behaviors throughout the experience. Websites and apps built on content properties typically have a section dedicated to e-commerce, and perhaps another that showcases social media interactions. So there’s no revelation in suggesting that they be woven into a franchise hub. But because they are so endemic to digital, hub design suggests that these core behaviors should be ubiquitous, rather than confined to separate sections of the experience. Commerce and social are just two examples. On each screen, and in every context, the ability to transact, or advocate to one’s peers should never be more than a tap away. Core behaviors might also include device-to-device bridging (for multi-screen applications), or management of a user’s account “wallet” that could include a points-based currency. To put this into perspective, Hollywood is certainly not on life support. There is plenty of evidence of both its continued business dominance and cultural significance. Global box office revenue exceeded $26b in 2013, and international continues to grow in the high single digits annually. But the challenges of hyper-efficient distribution and audience fragmentation represent “unhealthy” conditions that require a remedy. Continued growth depends on profitability throughout long life cycles, and this is why franchises have become so important. The landscape is now as blockbuster-centric as ever because studios are putting more eggs in fewer baskets. Portfolio theory would call this lack of diversification a relatively risky behavior. As the high end of the marketplace becomes more competitive, studios will need all the traction they can get. Today, rather than simply a new format (e.g., Blu-ray) or an emerging service (e.g., Netflix), the industry’s opportunity lies in the confluence of key technologies: powerful devices, robust connectivity, and copious cloud-based resources. Unprecedented flexibility in the way that content is exploited will allow studios to corral audience and — through the development of CRM data collection and analysis — to know them as never before. Franchise hubs will be challenging to build, but are a necessary part of the more “lean-forward” approach that major content owners must take in modern content landscape.